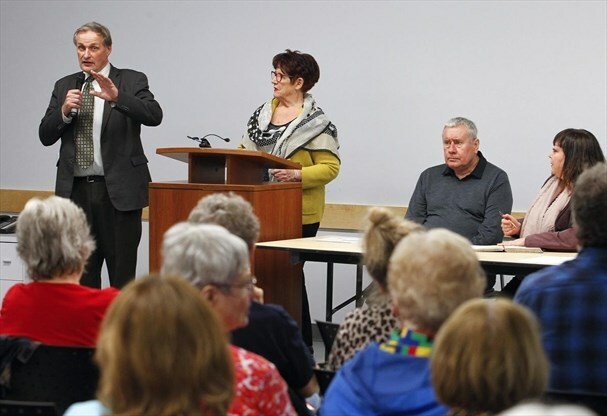 NDP Deputy Leader John Vanthof, the MPP for Temiskaming Shores, spoke during an Ontario Health Coalition town hall in Peterborough on Wednesday night. The meeting was held to discuss Premier Doug Ford’s government’s plan to create an Ontario Health super agency that will replace 20 smaller agencies, including Ontario’s 14 local health integration networks, Cancer Care Ontario, eHealth Ontario and several other agencies. The Ford government has said the consolidation aims to streamline management-level jobs, rather than front-line jobs.